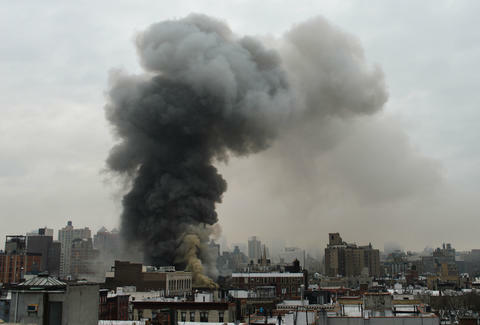 At least 12 people are injured after a possible gas explosion caused a massive fire that raged in the 100 block of 2nd Ave near 7th St in the East Village Thursday afternoon, according to multiple reports. At a press conference, Mayor Bill de Blasio said three of the 12 injured suffer life-threatening injuries. Fire officials said approximately 250 emergency personnel were dispatched to the 7-alarm fire at 121 2nd Ave, a mixed occupancy building, which includes apartments and retail or restaurant spaces. The New York Daily News reported that officials believe the fire was caused by a gas explosion at a restaurant in the building, Sushi Park. And as Eater reported, two restaurants -- Sushi Park and Pommes Frites -- appeared to have been destroyed in the blaze and building collapse. Phone calls made to both Sushi Park and Pommes Frites did not go through. De Blasio said four buildings were involved in the explosion and affected by the fire, and that preliminary evidence suggests the explosion was "gas-related." At least one of the buildings has collapsed. Officials at the press conference said there are no signs of fatalities and that firefighters made extremely dangerous searches of the building prior to its collapse. As of 5:45pm, there were no reports of anyone missing in the buildings. This photo by the Daily News appears to show the Sushi Park storefront blown out and fire raging in both the building above and the building next door that houses Pommes Frites. Tony Merevick is Cities News Editor at Thrillist. Send news tips to him at tony@thrillist.com and follow him on Twitter @tonymerevick.